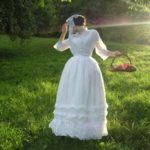 That’s the Victorian corset I often wear under my Victorian dresses. 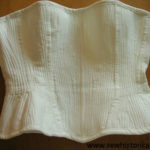 I’d bought it before I made my own corsets. 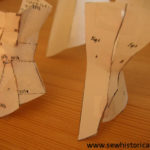 It’s a modern corset but it has the shape of an 1850s corset. May I ask what brand corset you wear or what store it’s from? Do you think cotton is best? Thank you. 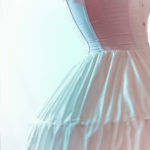 The modern corset has 12 bones, a lightly boned Edwardian corset which I’ve sewn has ten bones (German plastic boning), and the Edwardian silk corset which I’m sewing at the moment is heavy boned with 18 bones (spring steel bones and German plastic boning), while some of my corsets have no bones, such as the Victorian corded corset and the wool working women stays.